During his stint on on the television show “MADtv,” Jordan Peele appeared in a recurring comedy sketch titled “Inside Looking Out,” playing a black man who sheds his cultural identity for the sake of his interracial marriage, all the while oblivious to his wife’s racially insensitive asides. The dynamic of interracial relationships is the fulcrum of Get Out, Peele’s audacious directorial debut. Chris Washington (Daniel Kaluuya) is a young African-American dating college student Rose Armitage (Allison Williams), and they have reached the point where it’s time to visit her parents, who apparently don’t know Chris is black. After arriving at their bucolic homestead, Chris is unsettled by the odd behavior of not just Rose’s psychotherapist mom Missy (Catherine Keener) and neurosurgeon dad Dean (Bradley Whitford), but also their affluent friends and the hired help around the suburban estate, housekeeper Georgina (Betty Gabriel) and groundskeeper Walter (Marcus Henderson). At first, their reactions to Chris border on ubiquitous; it eventually shifts into something more stilted and spooky, particularly from the few other black denizens. Beyond mere gore, two elements have long been at the heart of the horror film genre: humor (intentional and otherwise) and social commentary. Sometimes the laughs are coping mechanisms insulating the viewer from the bloody onscreen shocks. Some films, like Shaun of the Dead, are more comedies encased by the penumbra of horror tropes. Peele (Key & Peele) says he drew tonal inspiration from films like The Stepford Wives and Rosemary’s Baby, which topically speak to women’s liberation and rights. Get Out is Peele’s racial analog, sort of a fear-filled update of Guess Who's Coming to Dinner. It should also be pointed out that Peele himself is married to a white woman, so the film’s autobiographical elements are both personal and generalized. Even Peele’s choice of setting is revealing: although the film is shot in Alabama, Peele sets the story in Upstate New York, removing any lazy stereotyping that some audiences would use to detach and absolve themselves from the searing social critiques. The allegory seemingly dissipates during the film’s freaky final act, when Chris learns the truth behind the chicanery. In actuality, the racial subtexts only sharpen. What begins as a wry take on the clash of cultural assimilation morphs into a funhouse mirror reflection on cultural appropriation and even slavery. 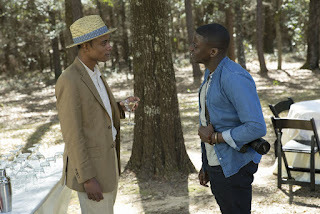 Get Out is quite purposefully funny throughout, particularly Chris’ friend and TSA employee Rod Williams (Lil Rel Howery) expertly playing the Shakespearean fool. But it’s also deadly serious. Let’s be clear: Peele equates the black experience in America with a horror movie, whether it’s simply walking down the street in a white suburban neighborhood, or just the mere approach of a police car. Even the film's title carries a double meaning. It's the obvious exhortation by film audience's to the naive victim who always ventures into the dark basement, wanders into the foggy cemetery or decides check out the abandoned barn. But in our current political climate, it's also the rallying cry of a rising tide expressing what they'd like to see happen to society's "others." If there’s a valid criticism, it’s that the film doesn’t have much to say on the topics it savagely skewers. But Peele does dare to skillfully skewer them, and in turn dares us to face them ourselves. Great movie! Gives you suspense during the crazy scenes. Made me feel stressed out for the character, loved it!